Looks great. I love this kind of post. In particular, figureing out how to do the work without obsessing over what the end result is going to be. I can too easily get stuck in “it needs to be x dimensions to be useful” and then I’m screwed. .-= JoVE´s last blog ..Maybe I’m not crazy =-. 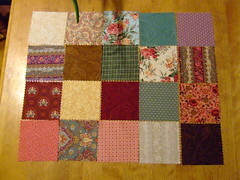 Yeah, I tend to pick the fabric & pattern I want, then figure it’ll be whatever size it is when I’m done. 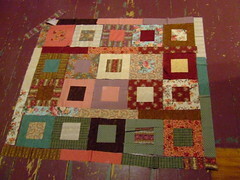 I might go for a wider border, depending on if I can find more fabric from the same line. Hmmmm. .-= andrea´s last blog ..Hello world! =-. Did I see you type “Wider border”. You are your mother’s daughter. If all else fails, make the borders wider. I just can’t feel the love for that fabric, but if you find some more, I’ll gift it to you. Love………your very generous, always considerate Mother. 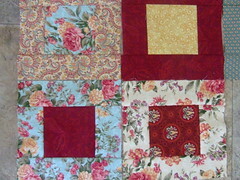 .-= Mam´s last blog ..Eye candy for quilters =-.